Bank Reconciliation is a process of matching the balances in an entity's accounting records of a cash account to a corresponding account in its bank statement. The goal of this process is to ensure that there are no differences between the two so that they match, as well as to help make appropriate adjustments to accounting records. Select a bank account for your bank reconciliation (for example: Bank BCA Account). Select the type of bank you intend to use; Sleekr Accounting currently facilitates bank statements from BCA Bank and Mandiri Bank. If you wish to import a bank statement from a different bank however, Sleekr will provide a bank statement template and format to help you with the import. Once you are done, click Import Statement. The following statement import form will appear on your screen. 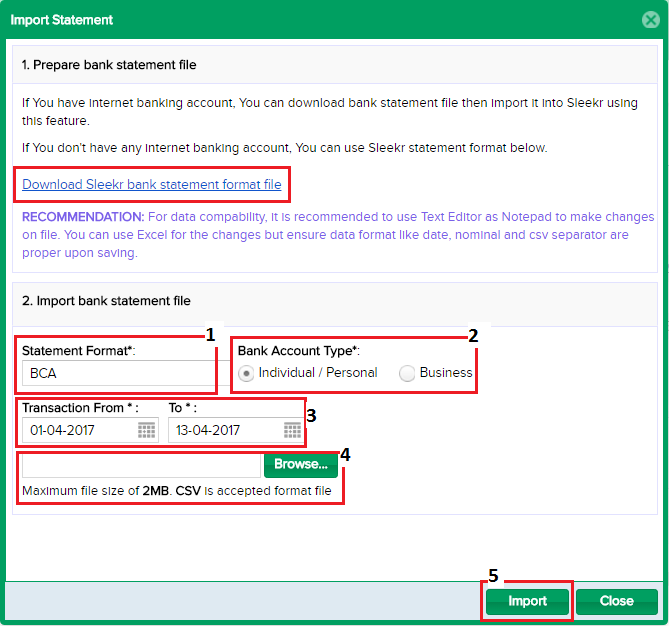 If you wish to use your internet banking account, you will also be able to use a customised bank statement in excel format - in which you can input the details of your bank statement and upload it back via the import option (explained in # 4). Type of Account: Select the type of account provided: Individual/Personal and Business Account for BCA Bank; and Individual/Personal account for Mandiri Bank. Adjust the following with your bank account. Transaction From & To: This is the period stated in your bank statement. Sleekr facilitates reconciliations of a period of 1 month or 30 days. Import: Click import once all the information you have filled in/uploaded is correct. If you feel that the information on your bank statement is not correct, you can erase the following transaction record by clicking on the X symbol. If you feel that the information on your bank statement is already correct then you can proceed by clicking on the OK symbol. If you come across a notification saying "1 potential match transaction", this means there is 1 transaction consisting of the same date, description and/or amount; and therefore you have one potential match. Add Transaction: Through this option, you will be able to add a transaction record that matches the information on your bank statement if it is not already registered. Transfer: Through this option, you will be able to carry out transfers from your bank account to a different cash or bank account. Search: Through this option, you will be able to search for a different existing transaction that may be a better potential match to the information in your bank statement. Sleekr Accounting will show your bank reconciliation records based on its period. You can display reconciled account details by enabling the bank reconciliation detail mode through the View column. You will be able to see the details of each transaction through this option. A transaction record highlighted in green and labelled as Reconciled means that the following transaction has been reconciled. A transaction record highlighted in orange and labelled as Unreconciled means that the following transaction has not been reconciled. 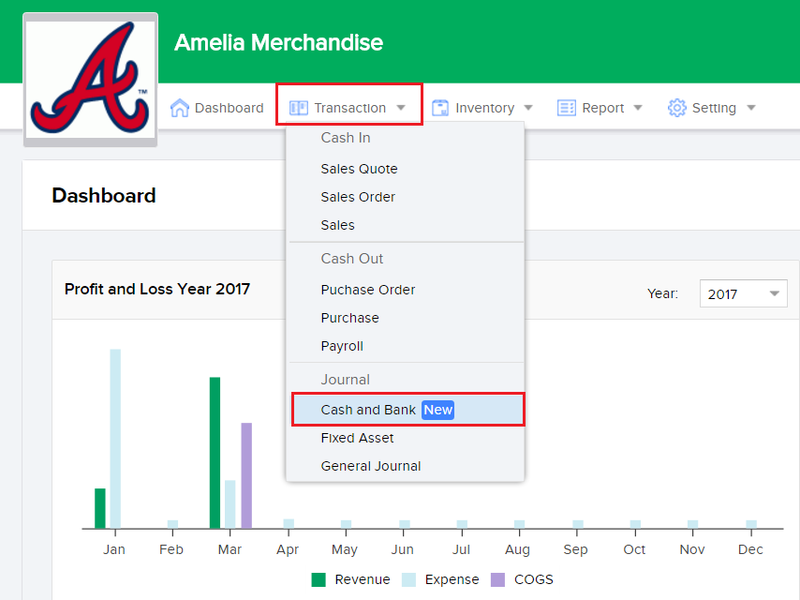 You will be able to cancel your bank reconciliation record by selecting the reconciliation entry and by then clicking on the Unreconcile button. You will be able to erase your reconciliation record by selecting the reconciliation entry and clicking on the Delete button.